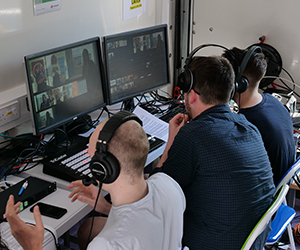 The project that makes me smile the most this year is the live outside broadcast that we did from Queen Alexandra Hospital in Portsmouth, in preparation for the birthday celebrations of NHS70. Occasionally we received requests from external agencies would like to make contact for potential collaboration, and on a day back in February this happened with QA Hospital, which inspired a response from us to offer a television project. The hospital Communications Officer received a very passionate phone reply from me offering a live programme to be transmitted from the hospital location, and, after hearing my enthusiastic pitch, she began laughing. Thinking back, I can only imagine what Carolyn Hughes must have thought listening to me offering unlimited television opportunities, but thankfully our offer was quickly taken seriously, and within the week I had met with the core communications team. I said earlier this project makes me smile when I think back to it, and the key reason is because of the people that we met for the first time, some from the hospital, some from our own University. My colleagues and I had noticed a University of Portsmouth outreach vehicle appear the year before, and the vehicle had a design that was perfect to house a television crew on an OB. One phone call to the staff in charge of the vehicle produced a “tell us what you want, we can make it happen” response, and in a world of risk assessment, red tape, and ‘computer says no!’ hurdles, I cannot express how refreshing an experience it was to meet staff with such a positive attitude. Those of you that have worked on OB’s will know the amount of planning that needs to be invested into a project that you hope will produce content that engages an audience, and two months of hard work all came together on May 7th 2018. So, did it all go to plan? There were a few times throughout the day where it looked as though all of our efforts might slip into the sea, never good for your stress levels! Who knew, for example, that the website allowing us to enable our satellite time would go down an hour before we were to go live!! Then there was the slight complication where our student presenters were caught in traffic thus denying a proper rehearsal. They say hysterical laughter is good for the soul, I’m not sure it works for live TV, but it sure does make it memorable. Some last minutes changes to the running order (and these were real last minute) helped keep those stress levels mega-high, but ultimately the show was transmitted as intended, and it remains the craziest, most stupid, mad-bonkers 30 minutes of the year thus far, and I’m not expecting it (or wanting it for that matter) to be bettered. I applaud the students (Team Yellow) of TV and Broadcasting for agreeing to put such a show together, and my sincere thanks to Carolyn Hughes, Allison Stratford, Victoria Greenshields, Emma McKinney, and Lauren Eyers for deciding to go on this journey with the University of Portsmouth. Thank you to Lucy Dobson and Mick Harper for your ‘lets make it happen’ attitude regards the outreach vehicle, and to Steve Bellinger, Gary Bown, Louise Lovesey, Mike Parsons, and our visiting Erasmus students (Lea Pradel, Laura Dietsch, Rodrigue Kroese & Valentin Scion) that helped give an extra shine to the project. As the dust begins to settle on this academic year, we again look to the future and wonder what adventures 2019 will bring.